Agricultural productivity is measured as the ratio of agricultural outputs to agricultural inputs. While individual products are usually measured by weight, their varying densities make measuring overall agricultural output difficult. 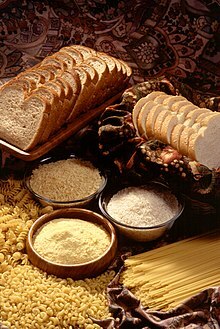 Therefore, output is usually measured as the market value of final output, which excludes intermediate products such as corn feed used in the meat industry. This output value may be compared to many different types of inputs such as labour and land (yield). These are called partial measures of productivity. Wheat yields in least developed countries since 1961. 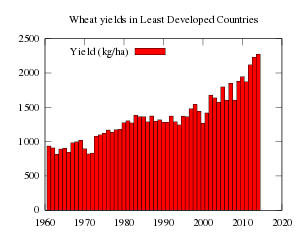 The steep rise in crop yields in the U.S. began in the 1940s. 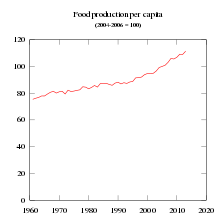 The percentage of growth was fastest in the early rapid growth stage. In developing countries maize yields are still rapidly rising. See: Productivity improving technologies (historical) Section: 2.4.1: Mechanization: Agriculture, Section 2.6: Scientific agriculture. The productivity of a region's farms is important for many reasons. Aside from providing more food, increasing the productivity of farms affects the region's prospects for growth and competitiveness on the agricultural market, income distribution and savings, and labour migration. An increase in a region's agricultural productivity implies a more efficient distribution of scarce resources. As farmers adopt new techniques and differences, the more productive farmers benefit from an increase in their welfare while farmers who are not productive enough will exit the market to seek success elsewhere. As a region's farms become more productive, its comparative advantage in agricultural products increases, which means that it can produce these products at a lower opportunity cost than can other regions. Therefore, the region becomes more competitive on the world market, which means that it can attract more consumers since they are able to buy more of the products offered for the same amount of money. Increases in agricultural productivity lead also to agricultural growth and can help to alleviate poverty in poor and developing countries, where agriculture often employs the greatest portion of the population. As farms become more productive, the wages earned by those who work in agriculture increase. At the same time, food prices decrease and food supplies become more stable. Labourers therefore have more money to spend on food as well as other products. This also leads to agricultural growth. People see that there is a greater opportunity to earn their living by farming and are attracted to agriculture either as owners of farms themselves or as labourers. However, it is not only the people employed in agriculture who benefit from increases in agricultural productivity. Those employed in other sectors also enjoy lower food prices and a more stable food supply. Their wages may also increase. Increase in agricultural productivity is often linked with questions about sustainability and sustainable development. Changes in agricultural practices necessarily bring changes in demands on resources. This means that as regions implement measures to increase the productivity of their farm land, they must also find ways to ensure that future generations will also have the resources they will need to live and thrive. Between 1950 and 2000, during the so-called "second agricultural revolution of modern times", U.S. agricultural productivity rose fast, especially due to the development of new technologies. For example, the average amount of milk produced per cow increased from 5,314 pounds to 18,201 pounds per year (+242%), the average yield of corn rose from 39 bushels to 153 bushels per acre (+292%), and each farmer in 2000 produced on average 12 times as much farm output per hour worked as a farmer did in 1950. For many farmers (especially in non-industrial countries) agricultural productivity may mean much more. A productive farm is one that provides most of the resources necessary for the farmer's family to live, such as food, fuel, fiber, healing plants, etc. It is a farm which ensures food security as well as a way to sustain the well-being of a community. This implies that a productive farm is also one which is able to ensure proper management of natural resources, such as biodiversity, soil, water, etc. For most farmers, a productive farm would also produce more goods than required for the community in order to allow trade. Diversity in agricultural production is one key to productivity, as it enables risk management and preserves potentials for adaptation and change. Monoculture is an example of such a nondiverse production system. In a monocultural system a farmer may produce only crops, but no livestock, or only livestock and no crop. The benefits of raising livestock, among others, are that it provides multiple goods, such as food, wool, hides, and transportation. It also has an important value in term of social relationships (such as gifts in weddings). In case of famine, when crops are not sufficient to ensure food safety, livestock can be used as food. Livestock may also provide manure, which can be used to fertilize cultivated soils, which increases soil productivity. On the other hand, in an agricultural system based only on raising livestock, food has to be bought from other farmers, and wastes produced cannot be easily disposed of. Production has many functions, and diversity is the foundation of such production. To ignore the complex functions provided by a farm is thought by many to turn agricultural production into a commodity. ^ Preckel, Paul V.; Hertel, Thomas W.; Arndt, Channing; Nin, Alejandro (2003-11-01). "Bridging the Gap between Partial and Total Factor Productivity Measures Using Directional Distance Functions". American Journal of Agricultural Economics. 85 (4): 928–942. doi:10.1111/1467-8276.00498. ISSN 0002-9092. ^ Agricultural Investment and Productivity in Developing Countries, FAO Economic And Social Development Paper No. 148, ed. Lydia Zepeda, 2001, FAO Corporate Document Repository, 12 July 2007, http://www.fao.org/docrep/003/X9447E/x9447e00.HTM. ^ Fischer, R. A.; Byerlee, Eric; Edmeades, E. O. "Can Technology Deliver on the Yield Challenge to 2050" (PDF). Expert Meeting on How to Feed the World. Food and Agriculture Organization of the United Nations. Archived from the original (PDF) on 2017-08-09. ^ Egli, D.B. (2008). "Comparison of Corn and Soybean Yields in the United States: Historical Trends and Future Prospects". Agronomy. 100: S79–88. doi:10.2134/agronj2006.0286c. ^ Mundlak, Yair, "Agricultural Productivity and Economic Policies: Concepts and Measurements," OECD Working Paper No. 75, OECD Development Center, August 1992, SourceOECD.org, 13 July 2007 http://miranda.sourceoecd.org/vl=4172647/cl=20/nw=1/rpsv/cgi-bin/wppdf?file=5lgsjhvj7g21.pdf (13–16). ^ a b Promoting Pro-Poor Growth: Agriculture, DAC Guidelines and Reference Series, Paris: OECD, 2006, OECD.org, 13 July 2007 "Archived copy" (PDF). Archived from the original (PDF) on 2007-08-17. Retrieved 2007-07-13. CS1 maint: Archived copy as title (link) (10). ^ Brown, Lester R. Plan B 2.0: Rescuing a Planet Under Stress an36353d a Civilization in Trouble. New York City: Earth Policy Institute, 2006.